Google has just quietly updated its Chromebook Pixel on its new Google web store. 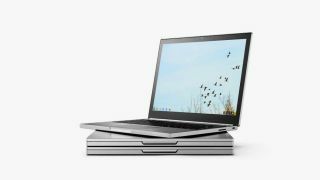 Priced starting at $999 (£670, AU$1,320), the new Chromebook Pixel launches the same week that Apple announced its new MacBook, and both devices support the new USB-C port. With a machined aluminum finish and solid build quality, you'll be forgiven if you mistake this year's new Chromebook Pixel with last year's model. Both generations sport a very similar design, though Google added two USB-C ports to this year's model, one on each side of the Pixel. This is a huge benefit over Apple's single USB-C port design on the new MacBook. As USB-C can be used to charge the laptops and provide input and output connections like a larger traditional USB port, having two ports allows you to charge the Chromebook Pixel while at the same time connecting the device to an external display. Speaking of charging, Google claims the new Chromebook Pixel lasts for 12 hours on a single charge, which is two hours more than Apple's 10-hour claim for the new MacBook. The device is also capable of fast charging - a 15-minute plugin to a power outlet will give you 2 hours of use. The Chromebook Pixel is powered by Intel's latest Broadwell Core i5 processor. In addition to the two USB-C ports, Google has also equipped the laptop with two full-sized USB ports, making it easy to connect existing peripherals to the Chromebook Pixel without having to buy additional cables or adapters. For expansion, there is also an SD card slot. A 3.5 mm headphone jack is also found on the device. The Pixel comes with 8GB of RAM and a 32GB SSD. A faster Intel Core i7 model with 16GB RAM and 64GB SSD is also available at $1299 (£875, AU$1,715). The Chromebook Pixel weighs 3.3 pounds (1.5kg) and is 0.6-inch (1.52 cm) thick. The 12.9-inch display has a 2,560 X 1,700-pixel resolution and is rated at 400 nits of brightness. The multi-color LED strip on the laptop's lid now also serves as a convenient battery level indicator. Simply double tap on the lid and you can quickly gauge how much of the 12-hour rated battery you have remaining. Compared to Apple's new MacBook, the Chromebook Pixel offers more power with Intel's Fifth-Generation Core i5 processor. Apple uses a more power efficient Intel Core M processor on its MacBook. Though less powerful than the Core i5 processor on the Pixel, the Core M's low heat output allows Apple to create a fanless laptop. Additionally, with the Chromebook Pixel, you'll live within Google's browser whereas the MacBook gives you access to Apple's full desktop-class OS X operating system. With a full desktop OS users are able to run any program designed for OS X, rather than having to run web apps.